We can all agree that one of the quintessential things to have during the summer is salsa, right? Granted, there are a million variations of salsa that you can make and create really easily. Some of the classics are mango, pineapple, peach, green chili, and that just scratches the surface. 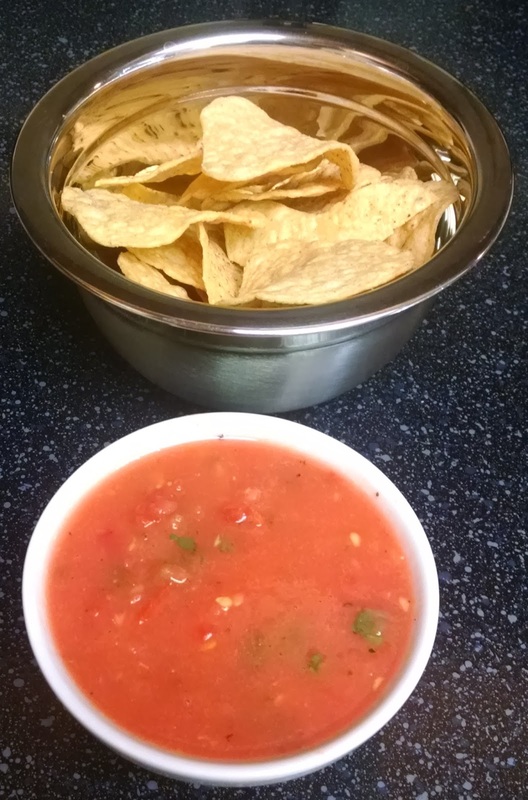 Salsa is so easy that you can have homemade salsa in about 5 minutes! Not only that, but chances are you have everything you need to make the salsa at home already. That means you don’t even have to leave the house and drive from store to store to find the ingredients you need. I am all about simplicity and making sure the ingredients you use can be found anywhere. So, the only question is how much time do you want to spend making your salsa? You can either dice and chop the salsa by hand and that only adds about 5 more minutes–still quicker than going to your local Speed-O-Mart. Or, you can throw it all the ingredients in a blender or food processor. It is really that simple. They are both perfect choices, but some people like their salsa a little more chunky, so maybe making the salsa by hand is a better way to go. Maybe you have some guests who like their salsa a bit more broken down, then blender salsa might be your answer. If you have someone who doesn’t care, well, do whatever gives you more time to enjoy the best part, eating. Honestly, some days I like to make it by hand because it keeps some of my knife skills, well, sharp. But, if you are trying to minimize adding that “special human touch” to your salsa, then blender or food processor salsa should be your final answer. NOTE: Once you have handled the jalapeno or any spicy pepper, wash your hands right away!! However, more importantly, do NOT touch your eyes, nose, mouth or any other sensitive skin as the oil from the jalapeno stays on your skin even after you have used soap!! The oils will cause burning and it is very unpleasant!! Sorry for the bold, underlining, italics, and caps, but I can’t stress this point enough about the jalapeno. I have done it and take my advice, it is very unpleasant. If you want to totally reduce the risk of the getting the oils on your hands, then grab a pair of latex gloves, clean dish scrubbing gloves or anything else that provides a barrier between the pepper’s oil and your skin. Make sure you discard the gloves right away and wash your hands still in case you get any on your skin while you are taking the gloves off. This recipe is the same for both being done by hand and thrown in the blender. I will include instructions for both. Dice first five ingredients, throw into bowl, add remaining ingredients, season with salt and pepper, stir, and adjust accordingly. Okay, cut the onion and jalapeno into pieces about the size of postage stamps or a little smaller. The real heat from the jalapeno is in the seeds and the white ribbing, so scrape that out with a spoon to tame the spice from the jalapeno. Again, be mindful of oils from the jalapeno as it can linger on your skin longer than you think. Peel the garlic cloves, and cut them in half. Throw the garlic, onion, and jalapeno into your blender/processor with the olive oil to allow the ingredients to move around the blade. Pulse or chop on low speed until have those ingredients are chopped finely. You can scrape down the bowl if ingredients are getting stuck on the side of the container or add a little lime juice to help as well. Cut tops off tomatoes and cut them into quarters, add a few quarters at a time until they are broken down. Don’t worry if they are super chunky now, you just want to be able to add the remaining tomatoes. Continue until all tomatoes are broken down, but pretty chunky. Add cilantro and a pinch of salt and pepper. Pulse or process till you have reached your desired consistency. Season with salt, pepper, or a little lime juice as needed. If you are just using this for chips, you can add a little less salt since most chips have a good bit of salt on them. But, if you feel like the salsa needs more, then go ahead and add it. I promise even with all these little steps the salsa comes together very quickly. If you want to add more spice or anything else, go for it! As I’ve said, this a stock salsa, that you can customize any way you want. If you are looking for something to go with this to wet your whistle, may I suggest a cold beer, a nice margarita, or for a responsible Friday night, some good quality tequila would be just fine. Make sure you have a driver, a friend, have turned in your keys or you have a place to stay for the night so you can really enjoy the evening the right way.